Hello Lovely Ladies! I am so excited for knit week here at Little Lizard King. Knits are super comfy on my little ones and they are quick to sew! Right now is the perfect time to grab some of the great knit patterns on sale this week. I will show you how to get this look from the Magnolia with a slight high-low, flowy skirt, and drop-waist. The Magnolia includes a circle skirt option which was perfect for the skirt. I wanted to create. Fabric choice was also important. I used a stretch velvet with a good drape for this top to get the flowy skirt. Rayon Spandex or other lightweight knits would also work well. Note: I did have to size up in width as this velvet had 2-way stretch. For reference the top I created is size 3 for length. To get the drop waist you will need to add some length to the front and back bodice pattern pieces. I wanted the bodice/skirt seam to hit about an inch above the belly button at the top of the curve. I needed to add 2 inches of length to the bodice pattern pieces. You can hold up the front pattern piece to your child to double check the amount to add to your pieces. First cut and tape your pattern pieces together. The back bodice you can simply add 2” to the bottom of the pattern piece. I did this by taping a scrap piece to the bottom of my pattern then using a straight edge drew a line 2” below the original pattern piece then trimmed off the excess. For the front pattern piece you will need to cut the pattern piece somewhere between the bottom of the armcyce and the bottom hem to add the length. This is so you can easily maintain the curved bodice. Next, on a scrap of paper draw 2 parallel lines 2” apart. Tape each side of your cut pattern piece to the scrap at the parallel lines. Trim off excess. To get the high-low look you will use 2 back skirt pieces. I used the top length but this would be a cute dress too! Since you added length to the bodice you can remove some from the skirt I trimmed off 1.5” from the bottom of my skirt pattern piece and left the velvet unhemmed. If you would like to hem your skirt you can trim just 1” from the bottom. Follow the pattern tutorial as written to complete your top/dress! 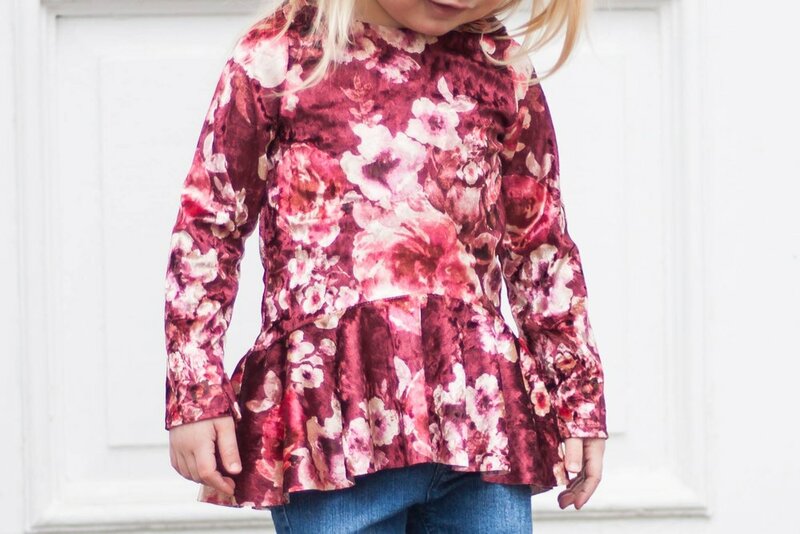 I just love this Magnolia modification in velvet, it makes an adorable and trendy top perfect for our cold weather right now.